Top row from left: Toyota Camry, Kia Stinger and Honda Accord; middle row: Alfa Romeo Stelvio, Honda Odyssey, Volvo XC60; bottom row: Chevrolet Colorado ZR2, Ford Expedition and Lincoln Navigator. LOS ANGELES -- Kia and Alfa Romeo have for the first time ever been named finalists for the North American Car, Truck and Utility of the Year Awards. The nine vehicles still in the running for the 2018 awards also include two chances for Honda to extend its winning streak to a third consecutive year. The three car finalists announced Wednesday at the Los Angeles Auto Show are the Toyota Camry, Honda Accord and Kia Stinger. The Camry and Accord, which have long battled for supremacy in the now-fading midsize sedan segment, will be up against Kia's first serious performance car. In the most competitive category, the utility finalists are the Alfa Romeo Stelvio, Honda Odyssey and Volvo XC60. They beat out 12 other semifinalists, including three from General Motors and three from Volkswagen Group of America. The truck award is a battle between Ford and Chevrolet. 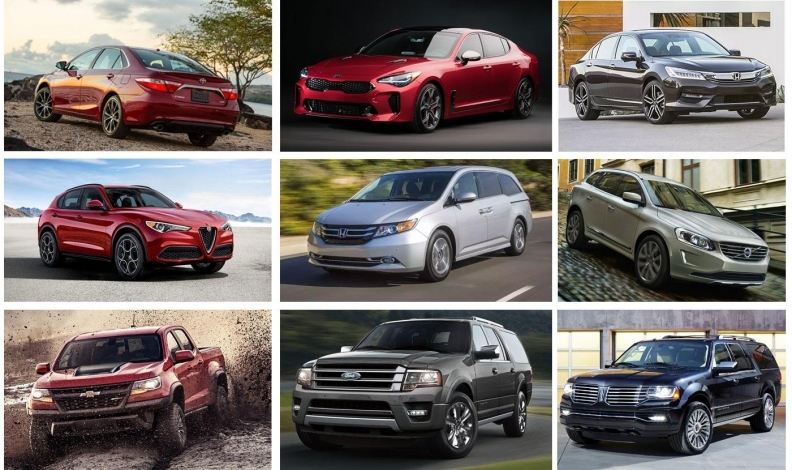 Only three vehicles were eligible, so all of them -- the Chevy Colorado ZR2, Ford Expedition and Lincoln Navigator -- automatically became finalists. For the first time in the awards' 25 years, nothing from a Detroit 3 brand was even under consideration in the car category this year. To be eligible, a vehicle has to be new or substantially changed and go on sale in the calendar year. The Tesla Model 3 was eligible, but the company declined to provide vehicles for testing, saying it was focused on increasing production. Other car semifinalists included the Hyundai Ioniq, BMW 5 series and Porsche Panamera. Honda won Truck of the Year in 2017 for the Ridgeline pickup and Car of the Year in 2016 for the Civic. The nine finalists were selected from a list of 29 vehicles announced in September. The winner in each category will be unveiled Jan. 15 at the Detroit auto show. The 60 jurors are automotive journalists from the United States and Canada. They include Automotive News' Richard Truett, an engineering reporter, and Sharon Silke Carty, an editor.